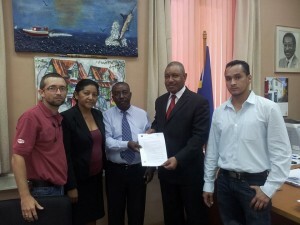 WILLEMSTAD - A delegation of immigrants in Curacao submitted yesterday a request to Minister of Justice Nelson Navarro to reconsider the newly revised immigration rates. According to the delegation, the amendments made to the rates form an obstacle for the immigrant. “So it has an impact on family members of immigrants (family reunion). This also applies to family members who were born in Curacao and their life partner,” the delegates indicated in their manifesto. The request, which was presented by Juan Carlos Pinto, Wilson de Lima, Benito Roche and Eloisa Palmera, presented several considerations regarding obstacles for family reunification. Navarro said that he will study the manifesto and evaluate the changes proposed in it for the National Ordinance on Admission and Expulsion and the Island Ordinance Fees, Municipal Taxes and Dues.